On Sunday, Oct. 16, Rev. Dr. Terrell H. Cistrunk stood before a packed church, filled with members, family, neighbors and friends at her ordination service commissioned by the Presbytery of Milwaukee . Rev. 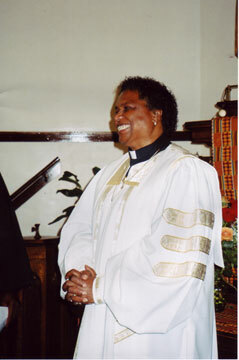 Cistrunk has been pastor of the New Life Presbyterian Church, 3276 N. Palmer St., for almost twelve years. The neighborhood has been changing, and the Presbytery gave her the charge to reorganize the church. Rev. Cistrunk is the right person for the job. Not only has she done an excellent job with reorganizing this congregation and increasing membership – which had only eight members when she took on the task – but she has revitalized the entire 3200 block of North Palmer Street. Pastor Cistrunk cut the neighbors’ lawns, shoveled snow and made home repairs. Her “lead-by-doing” attitude caused many residents to take additional pride in the neighborhood, and show renewed interest in home and community projects of their own. Residents who left the area, or family members of those who passed away, wanted Pastor Cistrunk to purchase their property, knowing that they could return in the future and look at it with pride. Pastor Cistrunk created jobs for residents who assist her with carpentry and lawn service work. Look for more news from this block and this congregation. A vacant lot maintained weekly by Pastor Cistrunk and her work crew is planned as the future site of a multipurpose community center. Kudos and best wishes to a very deserving minister, woman and carpenter who is building a congregation and a community.